COOL: Nick Holzherr (Apprentice series 8) | Everything is cool. 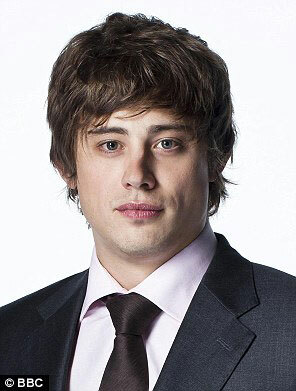 We’re halfway through The Apprentice Series 8 and, de-friend if you like but, we genuinely like one of the contestants! ‘When Nick was nine years old he earned money by selling lost golf balls back to golfers. He enjoys playing squash, snowboarding and cooking, and loves buying kitchen gadgets.’ (!!!) A.dorable. Gee, we even dig that fluffy Strokes-esq hairdo! How did this happen?? And more to the point – why is Nick Holzherr on this show with these tools? OK, sorry, Jade’s not a tool. She’s an ALIEN from Planet MONTONE!! Why that woman hasn’t had it in the ear from Sugar yet is a mystery. We just don’t get it. From series 1 to 7, the supposedly stringent vetting process made sure all candidates a) suffered from a personality disorder of some kind b) had a minor speech impediment that instantly alienated but emoted sympathy , and, c) had definitely shagged themselves at least once. But Nick Holzherr – hello anomaly! He’s a bright wholesome individual. Succinct in every way and you can be sure that kid’s NEVER shagged himself. During tasks, when tension are high, egos bickering left right and centre, Nick’s good nature truly shines. Watch from 20:39 onwards. Which is why we want him to win! Even though his audition tape makes us feel sick; poor thing looks like he’s got mumps (and what the hell happened to the water cooler that day, the guy’s as parched as a leper! ), he talks sense throughout. Oh hey! Look at Nick as a baby! Cheeky thing. Do you like Nick Holzherr too? 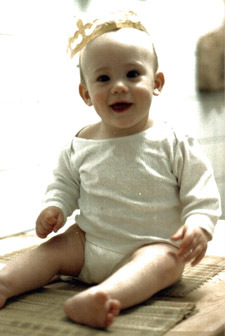 What do you think of the baby pic? Let us know! The Apprentice Series 8 is on Wednesdays at 9pm.